Ironically enough, the booze-slinging location doesn’t have any waffles. Plenty of restaurant chains don’t bother with the headaches of selling alcohol. But if they ever have a change of heart and do give booze a try, the move almost always gets people excited. Last year, Taco Bell garnered plenty of buzz by announcing plans to add alcohol at over 300 locations. Similarly, a few years back, a Denny’s in New York grabbed headlines by offering high-end cocktails (though that outpost eventually shut down). Now, another well-known American diner has just made its first foray into alcohol, but this new opening comes with a catch (and some hits, walks and strikeouts). 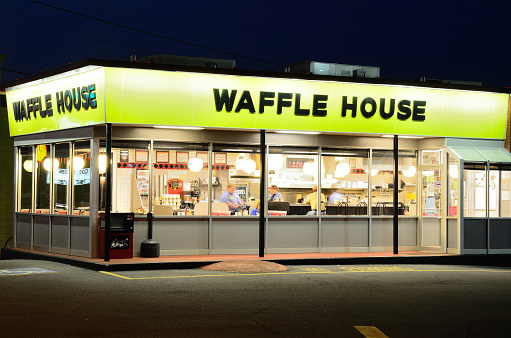 For the first time, a Waffle House is serving beer—but don’t expect to turn your go-to after-party spot into your new go-to drinking spot… that is, unless you have Atlanta Braves tickets. This new Waffle House location serves beer is because it’s peppered among the concession options within Atlanta’s SunTrust Park baseball stadium.